My buddy Mark stopped by the store the other day and showed off his copy of Concordia (2013). I have a copy of the game at the store but hadn't made the time to check into it more closely than just a passing glance. One cannot know every game. However, we broke out his copy and played a few rounds just to check it out and this one is just as intriguing to me as the games in the Harvest series, which is saying quite a bit. They allow a player to choose actions during the game.They are worth victory points (VPs) at the end of the game. 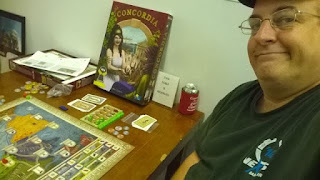 Concordia is a strategy game that requires advance planning and consideration of your opponent's moves. Every game is different, not only because of the sequence of new cards on sale but also due to the modular layout of cities. 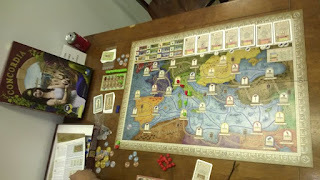 (One side of the game board shows the entire Roman Empire with 30 cities for 3-5 players, while the other shows Roman Italy with 25 cities for 2-4 players.) When all cards have been sold, the game ends. The player with the most VPs from the gods (Jupiter, Saturnus, Mercurius, Minerva, Vesta, etc.) wins the game. 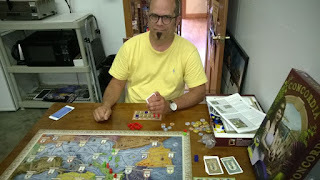 Even a brief bit of play convinced me this was a good game, good enough that I ordered a copy of the Concordia: Britannia & Germania (2014) expansion for us to carry and plan to get a copy of the Concordia: Salsa (2015) expansion as well. I have a feeling these will be coming home with me, though, so I'll have to get another copy of each for the store shelf.